Dutch painter. He received painting lessons from his uncle Willem de Heusch, one of the Italianate painters. In January 1675 he is mentioned for the first time as a member of the Schildersbent, an association formed by Netherlandish artists in Rome. Though it is not known how long lie remained in the Eternal City, we may assume it was quite a while, because he is still mentioned in Venice in 1696 - working for Secretary Lucatelli - and because the Italian motifs in his work all come from Rome and its surroundings. By 1699 the artist had returned to Utrecht, where he died two years later. 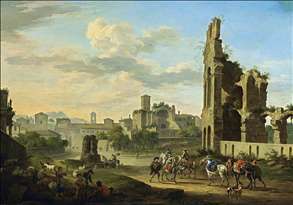 Jacob de Heusch belongs to the generation of Netherlanders who visited Rome for varying lengths of time during the last quarter of the seventeenth century. 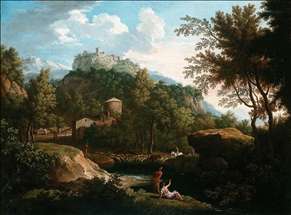 Unlike the Bamboccianti of the previous generation, such as Johannes Lingelbach, who were interested in the life of the people in the old city, these artists were fascinated above all by the Roman landscape and its surrounding countryside, as it had been immortalized by Claude Lorrain and Gaspard Dughet. Just as hundreds of their countrymen had done since the sixteenth century, they recorded the interesting buildings and painterly views they observed during their walks in sketchbooks full of drawings from nature. Most of them, including De Heusch, used these sketches to compose idealized landscapes in their studios in the style of the French-Roman masters that have just been mentioned. Most of De Heusch s paintings are freely conceived landscapes incorporating topographical motifs, in a style that recalls both Gaspard Dughet and the baroque landscapes of Salvator Rosa. These highly atmospherical views with their occasionally powerful architectonic effects and rather prominent clusters of figures may have had an impact on the young Carlevaris. 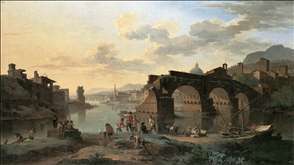 See more details about "Italian Landscape"
See more details about "River View with the Ponte Rotto"
See more details about "Rome: A View of the Forum Romanum"